“Hall of Shame” presents some of the worst cases of blight in the city in the hopes that someone from City Hall will take note. Well, one can only hope. What is it about elderly women in this town being plagued by blight? 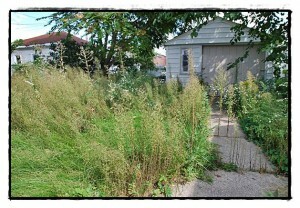 Maybe we’re exaggerating, but we have heard about another senior who has a nearby house with overgrown weeds. Rick Felkowski called us last week about his mother, Jean, who is 93 years old and has to deal with an abandoned house next-door at 11632 Gallagher. Rick said whoever lived there “just took off and went to Sterling Heights” a couple of years ago. As you can guess, no one is taking care of the property. And indeed the yard looks like a nature sanctuary. Actually, the single-family house looks like it’s in very good shape. Heck, there’s even a dish mounted on the roof that looks like it can still be hooked. It’s a good bet the house is in foreclosure, but there is no “for sale” out front. Rick says his mom has been living in the same house for 60 years. Imagine that. And 60 years ago was a much different time and place for Hamtramck. That would be the 1950s when Hamtramck’s population was about 50,000, and the city had the national distinction of being the cleanest city in America. Well, in taking a casual look around town, you can tell we are a long way from that. Hamtramck, you are looking pretty shabby these days. What’s frustrating is that for many properties, it really wouldn’t take that much to make a huge improvement. Anyway … back to the present. 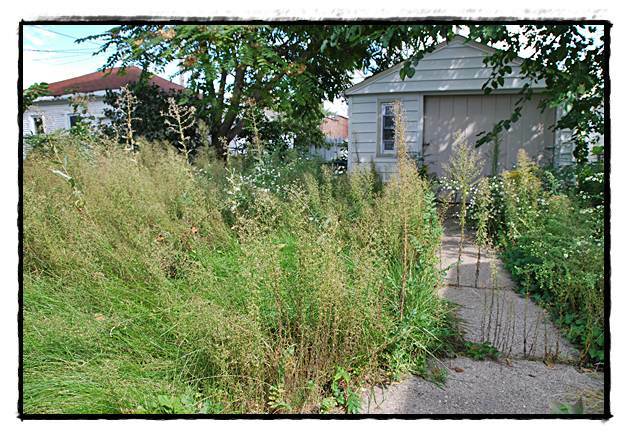 We’re still waiting to hear from people willing to volunteer to weed whack these properties. The good news is we heard from a guy named Larry who said he’s got the equipment and a van to haul yard waste, but wondered if he could dump the waste at the city’s unofficial dump site on, well we won’t say where for fear everyone will run over there and use it. We suggested he contact City Councilmember Catrina Stackpoole who been a part of the city’s Weed & Seed program. If you’d like to help out, call Catrina at Recycled Treasures, (313) 826-7158, or stop by the store at 12101 Jos. Campau. Hey blight-busters, give us a call or an e-mail if you know of a problem spot in the city. You can reach us at (313) 874-2100, or email us at: news@thethehamtramckreview.com, or just stop by the office at 3020 Caniff.